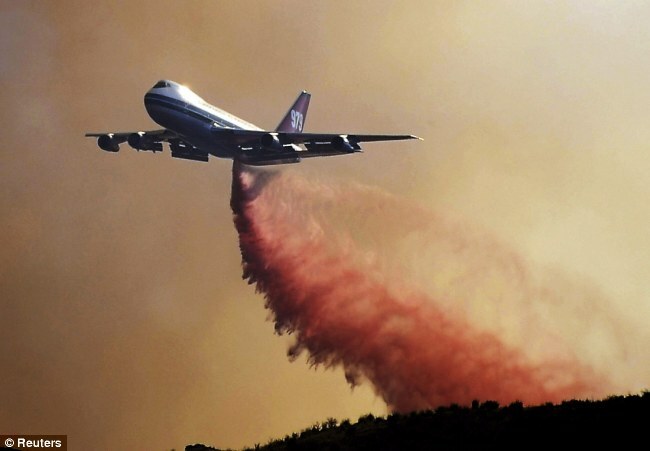 Crews battling the massive wildfire north of Los Angeles have received major assistance from the weather, allowing them to build lines around a quarter of the blaze, but the fight is far from over. Fire officials fear the winds could kick up later today, as flames creep closer to homes and a historic observatory. More humid weather and a slight break in the blazing heat helped the brush resist burning, but crews were bracing for the possibility of thunderstorms, dry lightning and wind this afternoon. 'Right now if I were in a boxing match, I'd think we're even today,' Dietrich said. Firefighters on Tuesday lit backfires and hand crews and bulldozers combed the foothills of the San Gabriel Mountains, cutting broad and winding fire lines, raising containment to 22 percent. 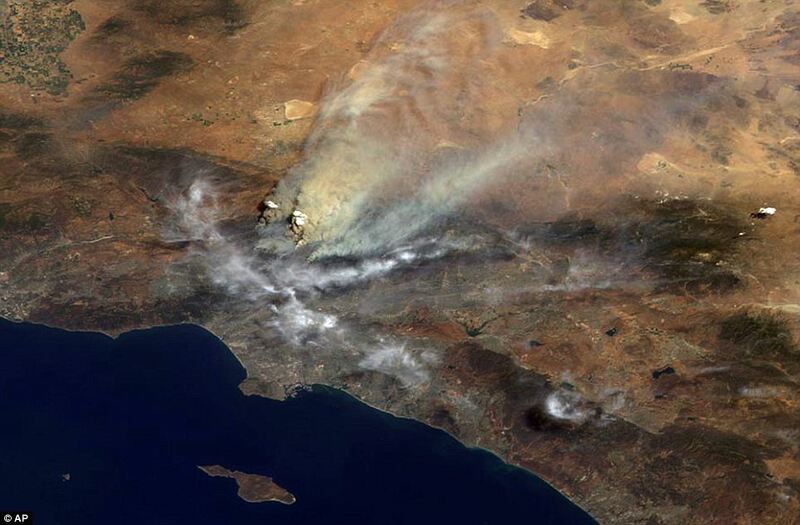 Since erupting on August 26th the blaze has destroyed more than 60 homes, scorched 199 square miles of tinder-dry brush and forced some 12,000 people to flee their homes. 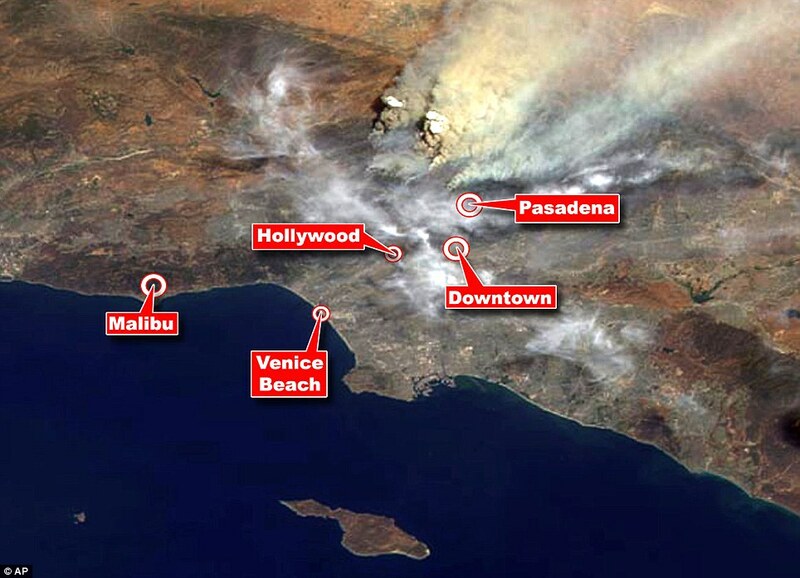 The fire has scorched 164 square miles of tinder-dry brush, destroyed 53 homes, and threatened more than 12,000 others. But firefighters have had one stroke of luck: with no wind blowing, they have so far been able to beat the fire back far enough to protect the suburbs of Los Angeles. The exact number of people injured or threatened by the fire was still not clear. Among those evacuated were Los Angeles Dodgers shortstop Rafael Furcal and his wife from their home in La Canada Flintridge. Furcal was given the day off for Monday's home game against Arizona. Over the weekend, three people who refused to evacuate were burned when they were overrun by flames, including a couple who had sought refuge in a hot tub, authorities said. Authorities said five men and one woman refused several orders to evacuate a remote ranch in a canyon near a place called Gold Creek. 'When we tried to get them out, they said they're fine, no problem, they didn't want to leave,' said fire spokesman Larry Marinas. Fire crews set backfires and sprayed fire retardant at Mount Wilson, home to at least 20 television transmission towers, radio and cell phone antennas, and the century-old Mount Wilson Observatory. The observatory also houses two giant telescopes and several multimillion-dollar university programs. It is both a landmark for its historic discoveries and a thriving modern centre for astronomy. If the flames hit the mountain, mobile phone service and TV and radio transmissions would be disrupted, but the extent was unclear. The blaze killed two firefighters who died when their truck drove off the side of a road with flames all around them. The victims were fire Capt. Tedmund Hall, 47, of San Bernardino County, and firefighter Specialist Arnaldo 'Arnie' Quinones, 35, of Palmdale. Hall was a 26-year veteran, and Quinones had been a county firefighter for eight years. Hall and his wife have two boys, ages 20 and 21, and was described as a family man who loved riding motorcycles. They died fighting a fire that showed no signs of subsiding yesterday. People who fled returned to find their homes gone. Beth Halaas knew her creekside home in Big Tujunga Canyon was gone when she saw her favorite Norwegian dishware on television news. 'It's just stuff,' she murmured, as her five-year-old son Robert kicked at a deflated soccer ball in his sandbox. She raked ceramic cups from the ashes. 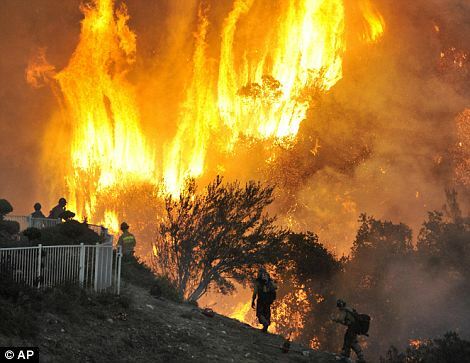 T.J. Lynch and his wife, Maggie, left for an evacuation center late Monday after the eerie orange glow on the horizon turned into flames cresting the hill near their Tujunga home. 'It's pretty surreal, pretty humbling, how your life is represented in these objects that you collect and then you have to whittle them down,' he said, describing the difficulty of choosing what to bring with them. Bert Voorhees looked through the empty shelves of a CD rack and his vanished vinyl collection at the seasonal stream that trickled through his property in Big Tujunga Canyon. Ellad left behind a family heirloom Persian rug and a photo album he put together after his father died. 'I'm going to have to figure out a new philosophy: how to live without loving stuff,' he said. The 275-acre (110-hectare) blaze was 50 per cent contained yesterday afternoon and full containment was expected by today. It wiped out an entire cul-de-sac, leaving only smouldering ruins, a handful of chimneys and burned cars. 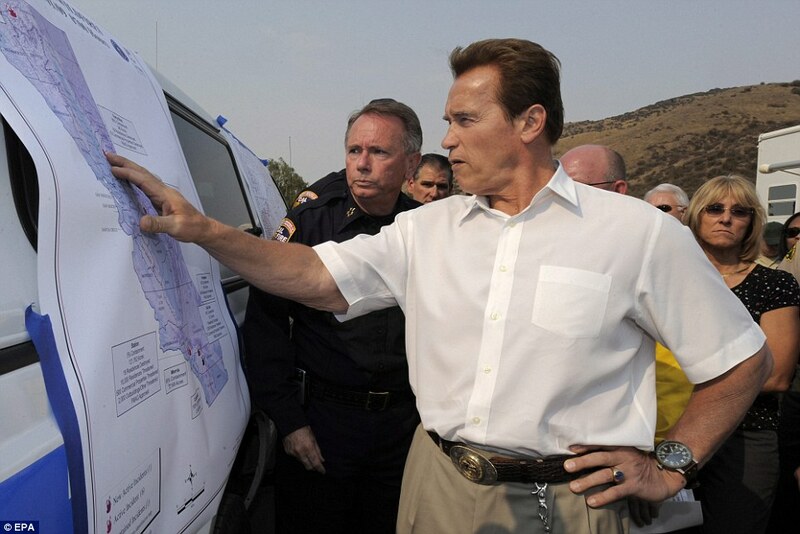 Governor Arnold Schwarzenegger toured the Auburn area, where only charred remnants of homes remained yesterday. At some houses, the only things left on the foundation are metal cabinets and washers and dryers. 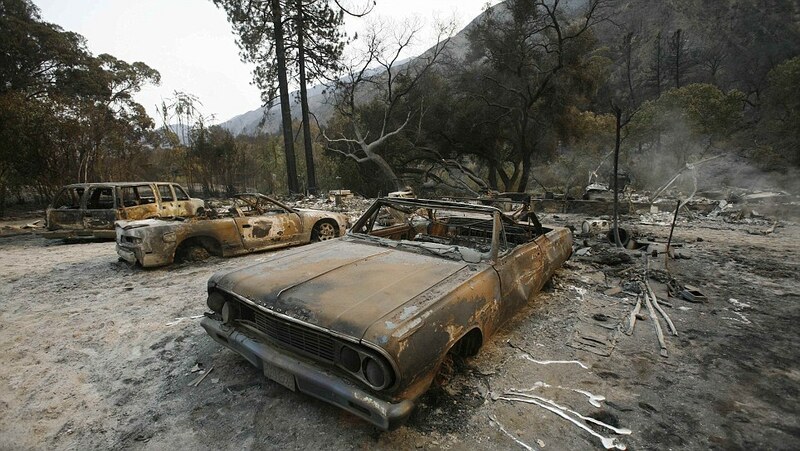 'It was embers travelling in the wind, landing on the roofs, landing on attics, getting into that home and burning the home on fire,' said Daniel Berlant, spokesman for the California Department of Forestry and Fire Protection. 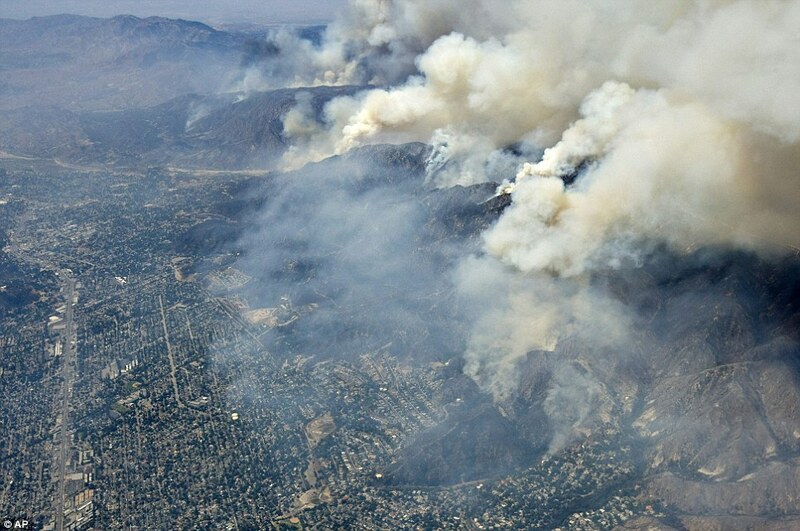 East of Los Angeles, a 1,000-acre (400-hectare) fire threatened 2,000 homes and forced the evacuation of a scenic community of apple orchards in an oak-studded area of San Bernardino County. Brush in the area had not burned for a century, fire officials said. 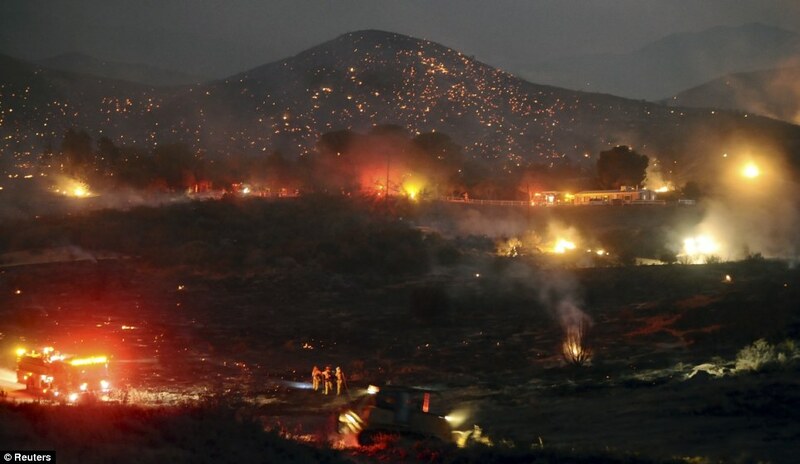 A few miles away a 300-acre (120-hectare) wildfire that erupted on the edge of Yucaipa forced the evacuation of 200 homes. 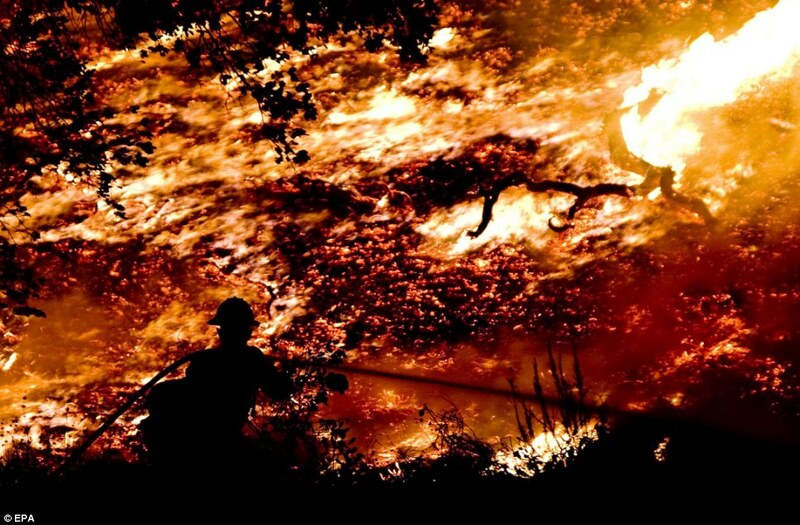 With highs topping 100 degrees (38 Celsius) in some areas and humidity remaining low, the National Weather Service extended a weekend warning of extreme fire conditions in the central and Southern California mountains. Winds were light, which prevented the flames from roaring at furious speed into towns. 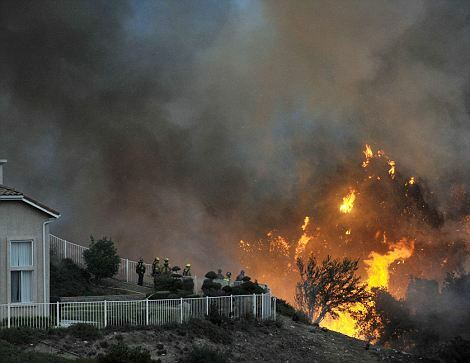 In 2003, a wind-whipped blaze tore through neighbourhoods in San Diego County, killing 15 people and destroying more than 2,400 homes. 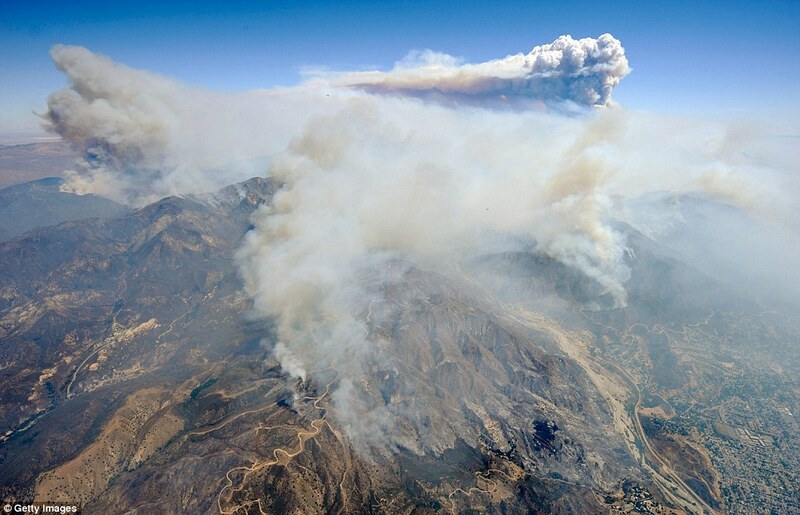 That fire burned 273,000 acres (110,500 hectares) - the largest in state history. Overall, more than 2,500 firefighters were on the line. 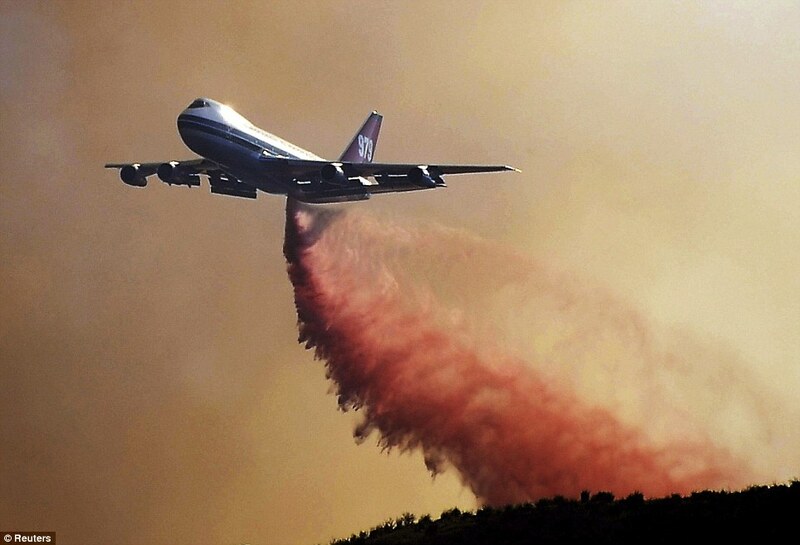 A fleet of helicopters and air tankers dumped water and retardant over the flames during the day. Also in La Crescenta, dispatchers accidentally activated a system that sent a late-night recorded evacuation warning to people. 'They pushed the wrong button,' he said. Terry Crews, an actor promoting the new movie 'Gamer' on KTLA-TV, talked about being forced to flee two days ago from his home in Altadena, in the foothills above Pasadena. He saw 40-foot (12-metre) flames, grabbed his dog and fled. An animal sanctuary called the Roar Foundation Shambala Preserve, six miles (10 kilometres) east of Acton, was in the mandatory evacuation zone, but fire officials decided removing the animals would be 'a logistical nightmare,' said Chris Gallucci, vice president of operations. It’s hurricane season, a time of year when residents in vulnerable areas—like New Orleans—need to hunker down, stock up and prepare for the unforeseen. But there are other places in the world where the dangers are so great that it’s hard to believe anyone is willing to stay put and fight it out with Mother Nature. Here, we have canvassed the globe for 10 places that require fortitude, resourcefulness and a great faith in one’s DIY skills to make it through the year alive. A monument reading "Polyus Cholada," Russian for "Pole of Cold," stands at the entrance to the city of Verkhoyansk. What makes Gonaïves so susceptible to destruction by hurricane? Aside from its coastal location on the Gulf of Gonâve, smack-dab in the cyclone-inclined Caribbean, Gonaïves rests on a flood plain prone to washing out when inland rivers swell. Furthermore, Haitians rely on wood to make charcoal, their primary source of fuel, and this has led to massive deforestation of the hillsides surrounding the city. As a result, when the rains come, the hills around Gonaïves melt away and mudslides nearly bury the city. Editor's note: Since the FBI arrested a Brooklyn businessman in late July on federal charges of organ trafficking, CNN has been conducting a worldwide investigation into the sale of kidneys using willing donors and willing recipients from China to Israel to the United States. Nick Rosen says he got $20,000 to donate his kidney and lied to the hospital's transplant team. 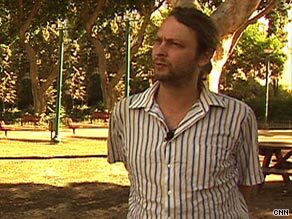 TEL AVIV, Israel (CNN) -- Four years ago, a young, cash-starved Israeli answered an ad in a newspaper for a kidney donor. "I decided I wanted to make a positive change in my life and do something different," Nick Rosen told CNN. "So I saw an ad in the paper and it said, 'Kidney Donor Wanted.' And called the ad in the paper, and they asked me my blood type." Ultimately, Rosen flew to New York and underwent surgery at Mount Sinai Medical Center to remove one of his two healthy kidneys. "Let's say I donated a kidney and received compensation," he said. Rosen's story is one of several that have come to light in recent weeks as part of a worldwide CNN investigation into what appears to be a widespread black market in human organs currently under scrutiny by authorities in the United States and Israel. Rosen says he was paid $20,000 for his kidney -- something he admits he lied about in interviews with the hospital's transplant team. A stunning "AC360" investigation. "Secret Harvest," the illegal trade in body parts. What Rosen did -- and what the man who received the kidney did -- violated a 1994 U.S. federal law that forbids the selling or purchase of live organs for cash. He not only got his money, but made an 11-minute documentary film he called "Kidney Beans" to show how easy it was to sell an organ. A portion of the documentary shows him lying on a bed, covered in cash he says he was paid. In a written statement, Mount Sinai told CNN: "The pre-transplant evaluation may not detect premeditated and skillful attempts to subvert and defraud the evaluation process." "Mount Sinai's transplant screening process is rigorous and comprehensive, and assesses each donor's motivation," the hospital said. A hospital medical source put it more bluntly: "We were duped." According to kidney transplant doctors, the process of pre-screening, blood-type matching and other related medical issues normally takes two months before any surgery. During that time, both recipient and doctor have to make several visits to a team of doctors, social workers and perhaps even ethicists before a final decision is made. Hospitals often ask donors to sign documents which ask whether they have received any compensation for donating a kidney or other organ. But no documentation is required to prove a family connection. The chief of nephrology at Mount Sinai later said hospitals and doctors are primarily concerned with medicine. "We're not detectives. We're not the FBI," Dr. Barbara Murphy said. "People can, on occasion, deceive us." But what Rosen did was not unique, according to the World Health Organization, which says 10 percent of kidney transplants worldwide are believed to be illicit. Dr. Eli A. Friedman, a leading kidney specialist, teacher and researcher at Downstate Medical Center in Brooklyn, said the United States leads the world in kidney transplants. About 16,000 of them are performed every year, he said. "That would mean that somewhere between 1,500 and 2,000 transplants in the United States might fall in the categorization of being illegal," Friedman said. He added, "I have had several experiences with patients with data that says they got a kidney from their brother, their sister or from their parent when they don't have a brother or a sister, " Dr. Friedman told CNN. " The transplant was performed under false circumstances." And Friedman said he's been offered bribes of $5,000 to $10,000 by kidney brokers. "Of course I was very happy to see them leave the office very rapidly," he said. The extent of the underground network came to the surface in late July, when FBI agents arrested a Brooklyn businessman on charges of organ trafficking. A federal complaint against Itzhak-Levy Rosenbaum said he had offered to provide a new kidney for a relative of an undercover FBI agent for about $160,000. According to the complaint, Rosenbaum told the agent he could buy the kidney for about $5,000 and gave instructions on exact procedures and methods to avoid detection. The complaint quoted Rosenbaum as bragging: "So far, I've never had a failure." Ronald Kleinberg, the attorney for Rosenbaum, told CNN he could not comment on the FBI complaint "because I have not had enough time to assess the information." He said CNN's "assertions are incorrect," and that law enforcement's account of Rosenbaum's network was inaccurate. But law enforcement sources said Rosenbaum had been the centerpiece of a kidney-for-sale operation, which he called "United Lifeline," that operated extensively for nearly a decade. The donors and patients in this network were linked by one common theme -- they were Jewish. Investigators say the donors usually came from Eastern Europe, were mostly poor and willing to sell their kidneys to U.S. and Israeli patients. According to one expert on organ trafficking, the FBI had been alerted to Rosenbaum's activities years ago. Nancy Scheper-Hughes, an anthropologist at the University of California at Berkeley and founder of a newsletter called "Organs Watch," said she had told the FBI about Rosenbaum and her suspicions about him seven years ago. "I think they thought it was a very few bad apples," Scheper-Hughes said. The FBI said would not officially comment on her assertions, but an FBI source later said, "We developed our own leads." According to Scheper-Hughes, the same day she spoke to CNN, she had learned of another illegal transplant surgery taking place at Cedars-Sinai Hospital in Los Angeles. The donor, she said, was a young Korean national who had received more than $25,000 for one of his kidneys. "This is a kid that does not speak much English, who is terrified and shaken," she said. "And he thought, 'Maybe I've made a mistake to do this, but $25,000 is a good amount of cash.'" Scheper-Hughes said the cash had been handed over in two increments, with the second paid to a relative in a hospital bathroom. In a statement, Cedars-Sinai spokeswoman Sally Stewart said living donors "must state they are not receiving payment for their kidney." "If at any time during the evaluation process, the transplant team suspects the donor is inappropriately being paid for a kidney, the transplant is canceled," she said. But a hospital source later told CNN, "We do not give lie-detector tests to our patients." According to Scheper-Hughes, who is in the final stages of writing a book on organ trafficking, much of the world's illicit traffic in kidneys can be traced to Israel. "Israel is the top," she said. "It has tentacles reaching out worldwide." Until March 2008, Israeli law allowed Israeli citizens to go abroad for live organ transplants from non-related donors. But there was no way for Israeli authorities to keep track of how many of those cases involved money changing hands, the country's Health Ministry said. Israeli investigators are looking intensively at illegal organ trafficking under the new law, the ministry said. And prosecutors in the West Bank town of Nazareth sent nine Israelis to jail in 2007 after uncovering a black-market ring that was buying and selling organs. Gilad Ehrlick, the assistant district attorney for Israel's Northern District, said he was shocked by the case. Secretly recorded conversations showed that Arab and Russian newspapers were targeting low-income Israelis and Palestinians with ads saying there would be payment in exchange for providing a kidney. "The idea was the people were calling out of despair, out of urgent need who needed a quick way to make money," he said. Jon Favreau and Robert Downey Jr. are bringing their iron-clad collaboration to another comic-book property: "Cowboys & Aliens." Downey has been attached to the DreamWorks/Universal project since last summer, when "Iron Man" co-screenwriters Mark Fergus and Hawk Ostby were working on the adaptation of the Platinum Studios Comics graphic novel written by Fred Van Lente and Andrew Foley. In the fall, Alex Kurtzman and Roberto Orci, who are executive producers on the project, took over scripting, along with "Lost" exec producer Damon Lindelof. Now Favreau has come on to make "Cowboys" his next directing gig. The sci-fi Western explores what would happen if the traditional Old West enemies -- cowboys and Native Americans -- found the prairie attacked by aliens in mid-1800s Arizona. Long in development, the "Aliens" project originally was set up at Universal and DreamWorks in 1997 with Steve Oedekerk writing and directing. It later moved to Columbia, with "Sahara" scribes Joshua Oppenheimer and Thomas Donnelly writing. The Favreau-Downey-Kurtzman-Orci-Lindelof nexus represents the current nucleus of geek-genre pop culture. Kurtzman and Orci recently delivered the sci-fi megahits "Star Trek" and "Transformers: Revenge of the Fallen," Lindelof maintains his control over the "Lost" mind screw, and Favreau and Downey will serve up another highly anticipated "Iron Man" saga next year. For DreamWorks, the property represents an essential tentpole to help elevate its newly independent status now that the studio's first round of financing is complete. DreamWorks included "Cowboys" among the 17 projects it bought from Paramount upon leaving last fall. As part of that exit arrangement, Paramount has an option to co-distribute the film with new DreamWorks distributor Disney, an opportunity it presumably will engage given Favreau's $585 million worldwide success on the Paramount-distributed "Iron Man." Imagine Entertainment principals Brian Grazer and Ron Howard -- the latter once a possibility to direct -- are producing with Platinum topper Scott Mitchell Rosenberg. Universal, where Imagine is housed, co-developed and is co-financing the project. As it ramps up production for the next few years' slates, DreamWorks likely would anchor its 2011 summer to "Cowboys." DreamWorks and Kurtzman and Orci also are developing the Platinum property "Atlantis Rising," another big-budget sci-fi hybrid, with director Len Wiseman and writer Joby Harold. The CAA-repped Favreau is in postproduction on Paramount/Marvel's "Iron Man 2," slated for a May release. As a writer and actor, he will next appear in the Oct. 9 Universal comedy "Couples Retreat." He is also providing a voice to the MGM comedy "The Zookeeper." A rare albino otter has been captured on camera by an amateur wildlife photographer in the north of Scotland. A rare albino otter has been spotted in Moray, Scotland. The Otter was captured by an amateur wildlife photographer. Karen Jack said the sight of the white animal eating a fish on rocks in Moray was "surreal". Grace Yoxon, of the Skye-based International Otter Survival Fund (IOSF) said the otter was "extremely rare". She said there were no figures for the number of albino otters, but it was unaware of there being any others reported in the UK. Ms Jack had to wait for the animal to reappear from the sea after catching a brief glimpse of it earlier. She said: "I have been into photography for about three years as a hobby and love photographing wildlife, landscapes and my two cats. "But it was just an amazing and surreal view of the albino otter, and for it to sit there and eat while we watched on was mind-blowing." Mrs Yoxon said: "It is extremely rare to see albino animals in the wild and to be able to get such wonderful photos is exceptional. "Karen was extremely lucky to have her camera with her - I am very envious." In March, IOSF took into its care an otter that latched on to two teenagers who were sledging, then followed them home. The cub was spotted in snow under a bush at Windygates, Fife, in February. He was nicknamed Dylan because one of the youngsters was playing a harmonica, an instrument synonymous with singer Bob Dylan. Extra Tidbit: Smurfette was originally created by Gargamel as an evil Smurf. When she turned good her hair went from black to blonde. It may be filled with soft and pink fleshy bits but this Japanese invention is by far the strangest representation of love we have seen in some time. 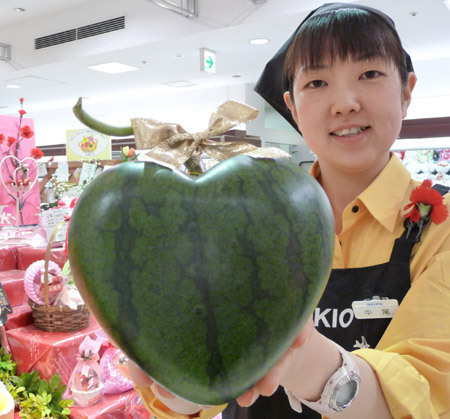 An enterprising farmer and his wife in Kumamoto, Japan have created a heart-shaped watermelon. It was an act of love for the couple where they wanted the fruit of their labor to symbolize their feelings for each other … and for their profession. Who says you can’t be too attached to your work? The endeavor took three years to perfect and thereby, does show profound dedication to their work. Of course this is hardly a surprise given that the country is famous for producing creatively-shaped fruits and vegetables. The couple managed to cultivate 20 watermelons in time for Mother’s day and sent off a few of them to be displayed at the Iwataya Department Store. People say that perfect love always comes with a price and this is certainly true for these watermelons. Each fruit was tagged at a hefty 15,750 yen ($160). While Disney lays down a $4 billion bet on the future of Marvel's superheroes, 20th Century Fox has already begun overhauling one of its big Marvel franchises, "Fantastic Four," to take the property beyond the two films already made. Akiva Goldsman has been hired to oversee the reboot as producer. Michael Green, the co-exec producer of TV's "Heroes" who co-wrote "Green Lantern," will write the script for the new "Fantastic Four." Fox wouldn't comment on its plans, but the moves are evidence that Marvel franchises do have enduring lifespans. As "Spider-Man 4" moves toward an early 2010 production start, Columbia Pictures recently hired James Vanderbilt to write a fifth and sixth installment with the understanding that one or both of those films would give the franchise a makeover with a new director and cast (Daily Variety, Aug. 16). The 2005 "Fantastic Four" and 2007 sequel "Rise of the Silver Surfer" were directed by Tim Story and starred Ioan Gruffudd, Jessica Alba, Chris Evans and Michael Chiklis. Since the deals for the reboot are just getting made, it is unclear if any of them will return. Though Marvel Entertainment owns and finances properties like "Iron Man" and "Thor," Fox controls "Fantastic Four" in perpetuity -- as long as it continues making the films. Fox has the same arrangement on Marvel Comics properties "X-Men," "Daredevil" and "Silver Surfer." Marvel is a producer and financial participant through a licensing agreement. Though the related Silver Surfer character soared in the "Fantastic Four" sequel, that iconic personality has remained a priority project for his own film at the studio. Fox has so far done one "X-Men" spinoff in "Wolverine." The studio is working on a sequel to that film and has scripts for "X-Men Origins: First Class," and "X-Men Origins: Magneto." Potential spinoffs for the Gambit and Deadpool characters have also been discussed. As producer, Goldsman is involved with several DC Comics transfers, including "Jonah Hex," "The Losers" and "Teen Titans." He was also producer of the Will Smith-Charlize Theron superhero film "Hancock," for which a sequel is being developed. One cop straight out of The Wire crunches the numbers with Esquire.com's political columnist to discover that America's prohibition of narcotics may be costing more lives than Mexico's — and nearly enough dollars for universal health care. So why not repeal our drug laws? Because cops are making money off them, too. We've heard a lot about the terrible death toll Mexico has suffered during the drug war — over 11,000 souls so far. This helps to account for the startling lack of controversy that greeted last week's news that Mexico had suddenly decriminalized drugs — not just marijuana but also cocaine, LSD, and heroin. In place of the outrage and threats that U.S. officials expressed when Mexico tried to decriminalize in 2006 was a mild statement, from our new drug czar, that we are going to take a "wait and see" approach. Still, we've heard nothing about the American death toll. Isn't that strange? So far as I can tell, nobody has even tried to come up with a number. To repeat, that's 6,487 dead Americans. Throw in overdoses and the cost of this country's paralyzing drug laws is closer to 15,000 lives. I'm basing these numbers on an interview with a high-ranking former narcotics officer named Neill Franklin. A member of the Maryland State Police for 32 years, Franklin eventually rose to the position of commander in Maryland's Bureau of Drug Enforcement. As he puts it, he was a classic "good soldier" in the drug war. Franklin's turning point came in October of 2000. "I lost a very, very close friend of mine, a narcotics agent for Maryland State Police," he says. "His name was Ed Toatley. He was assassinated outside of Washington, D.C., trying to make a drug deal in a park. He had a wife, he had three kids. I had just spoken to him a couple of weeks prior to him getting assigned to this particular deal — he was finally going to bring this guy down, and lo and behold the guy kills him." That got Franklin thinking. "I started doing the research and asking the questions: What progress are we making on this thing? And it turns out that not only are we losing kids who are in the game, but we are losing communities and fellow cops. We had lost a number of police officers in Baltimore alone." Another turning point was 2002, when Angela Dawson and her five kids were murdered in East Baltimore by drug dealers she had been tying to keep from doing business in front of her house. "They fire-bombed the house late one night and the whole family perished," Franklin remembers. So he started brooding on the drug war's body count. "Baltimore is a city of just a hair over 600,000 people. Our annual homicide rate was fluctuating between 240 and 300 every year for decades. Think about that: 240 to 300 homicides annually, and 75 percent to 80 percent are drug related. It's either gangs that are using drugs to support operations, or territorial disputes among drug dealers, or people just getting caught in the line of fire. And Baltimore is a small city compared to others," Franklin notes. "So we're not talking a handful of homicides; we're talking about the majority of the homicides in any city in the U.S. So if you add those cities up — just lowball it, take just 50 percent — I guarantee you, you'll find the numbers are quite similar to what they have in Mexico." I took his advice. In 2007, the last year for which hard numbers are available, 16,425 people were murdered. Since our most recent Census said that 79 percent of the country is urban, I cut out the rural Americans — although there's plenty of drug use there, too — and came up with 12,975 urban homicides. Low-balling that number at 50 percent, I arrived at a rough estimate of 6,487 drug deaths. Using 75 percent, the toll rises to 9,731. "And now we've got the cartel gangs coming up from Mexico," Franklin reminds me. "They're in over 130 cities in the U.S. already, and it's not going to get better." Neill Franklin's solution is radical: "You have to take the money out of it. Many people talk about legalization and decriminalize — it's still illegal, but you're just not sending as many people to jail, especially for the nonviolent offenses. However, the money is still being made in the illegal sales, so you still have the drug wars. It's prohibition that's killing our people. That's why people are dying." "So," I ask, "you want to legalize everything?" "Yes. But I like to put it like this: I want regulation of everything. Because right now, I think they're confusing prohibition with regulation. What I'm talking about is applying standards — quality control, just like alcohol. We should have learned our lesson during alcohol prohibitions — we repealed the Eighteenth Amendment and applied standards of sale and manufacture, so it has to be a certain quality and you can't sell it to just anybody, and you still go to jail if you sell it to the wrong people. So, among other things, you'll also reduce overdoses — the majority of the overdoses we have is people who don't know what they're getting or buying because the purity level fluctuates. In addition, people are afraid to get help because they don't want to go jail, so they let their friends die." So let's add overdoses to our death toll. In 2005, recent Senate testimony shows, 22,400 Americans died of drug overdoses. Leaving aside prescription drugs and counting only the 39 percent of overdoses attributed to cocaine, heroin, and methamphetamines, I count another 8,736 deaths. That brings us to 15,223 Americans dead from the drug war. But what about the argument that drugs will spread like wildfire if we don't keep bringing down the hammer? "First, there's no concrete study to support such a belief — it's all completely speculation," Franklin insists. "So in my left hand I have all this speculation about what may happen to addiction rates, and then I look at my other hand and I see all these dead bodies that are actually fact, not speculation. And you're going to ask me to weigh the two? Second, if the addiction rate does go up, I'm going to have a lot of live addicts that I can cure. The direction we're going in now, I've got a lot of dead bodies." I told Franklin I was surprised to hear a cop express so much sympathy for drug addicts. Even pro-drug types don't do that much. "I do have sympathy," he says. "What they're dealing with is a health issue, not a criminal issue. And as long as you treat it as a criminal issue, we're treating the symptom and not the cause." Last year, Franklin went public with his conclusions by joining a group called Law Enforcement Against Prohibition. Since then he's made it his business to talk to other cops about the subject, and he's been surprised by another discovery: "I find that 95 percent of my law-enforcement friends agree that we have to take a different direction, but they're not sure what direction that is — and probably 60 percent to 65 percent agree that we should legalize." And why, exactly, don't we hear about a possibly overwhelming majority of police wanting to legalize — not just decriminalize, but legalize — major narcotics? "Selfish reasons," he says. "There is a lot of money to be made in law enforcement. If we were to legalize, you could get rid of one third of every law-enforcement agency in this country." "And give back all the federal funds too. That's why very seldom will you see a police chief step forward and say, 'Yeah, we need to do this.'" I made a stab at crunching those numbers, too. In 2003, America's local police budgets (PDF) were $43 billion dollars. A third of that: $12.9 billion. Add another $9 billion in domestic and international law enforcement (PDF) and the number rises to $21.9 billion. Then consider America's prisons, the problems with which we've discussed here time and again. "The prison population is off the hook in this country," Franklin says. "In 1993, at the height of apartheid in South Africa, the incarceration of black males was 870 per 100,000. In 2004 in the U.S., for every 100,000 people we are sending 4,919 black males to prison. And the majority of those are for nonviolent drug offenses. But we'd rather send people to prison than give them information and treatment." So... our federal prison budget in 2007 was $6.3 billion, and 55 percent of the prisoners were there for drug offenses. The total state-prison budget for the U.S. in 2007 was $49 billion, according to this study from the Pew Foundation, which found that "at least" 44 states had gone into the red to incarcerate their citizens. Using the same 55 percent number — which is probably low — we arrive at a rough total of the prison expenses associated with the drug war: $30.4 billion. "I know jails are a big business and keep lot of people employed," Franklin says, "but it doesn't make it right." 15,223 dead and $52.3 billion spent each year — which is, incidentally, almost enough to pay for universal health care. "We've got serious constitutional issues involved, too," Franklin adds. "Improper search and seizure is occurring every day..."
But I'll save that for another column. Correction appended: An earlier version of this column estimated an incorrect fraction of America's local police budgets. Sound off on the drug war! Click here to e-mail John H. Richardson about his weekly political column at Esquire.com.